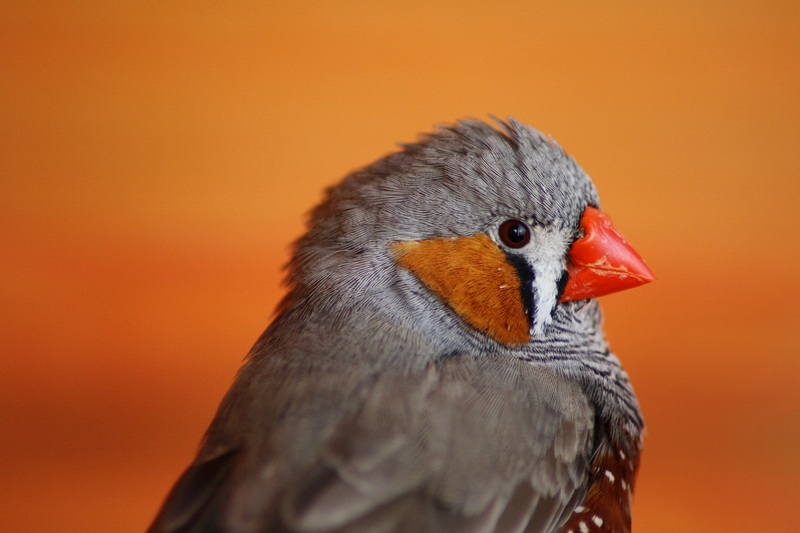 The Zebra Finch, also known as spotted-sided finch, chestnut-eared finch, Nyi-Nyi and Nyeen-ka (Aboriginal names), is a species of Australian birds highly popular as pets around the world. 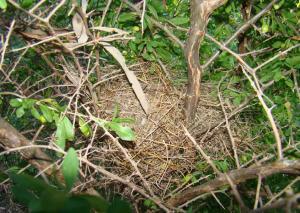 These birds and extremely energetic and excitable, and belong to the smaller group of birds. They are gregarious and tend to move around in groups, and are quite adaptable to human presence, and hence, are also found dwelling in the urban areas too. 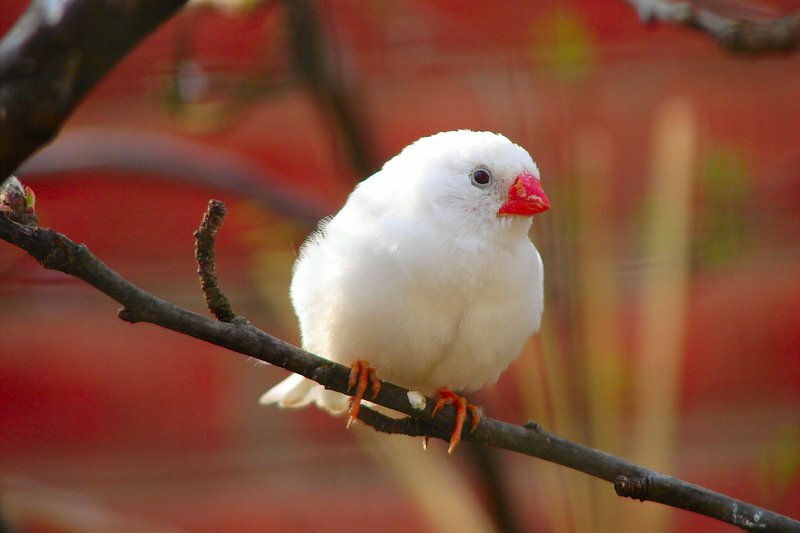 Newly-bred English zebra finch is also popular in England. 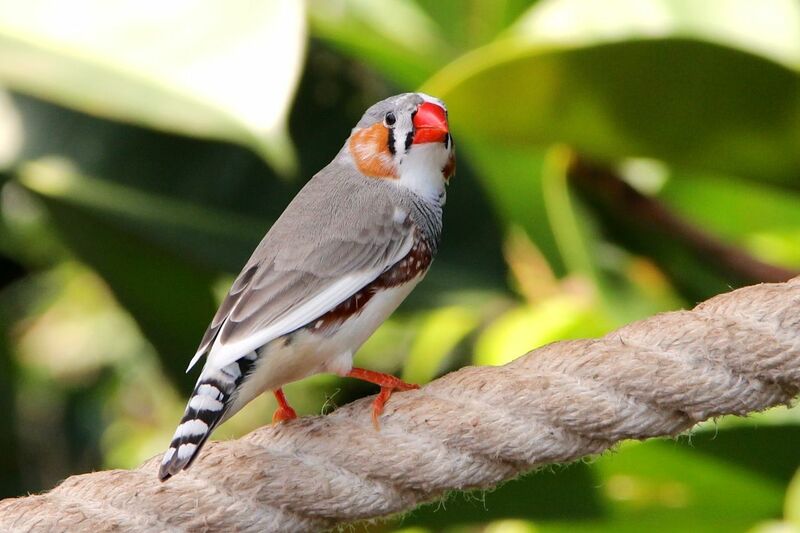 Size: Zebra Finches are very small birds and the size of the adult zebra finches is approximately 10 cm (4 inches). 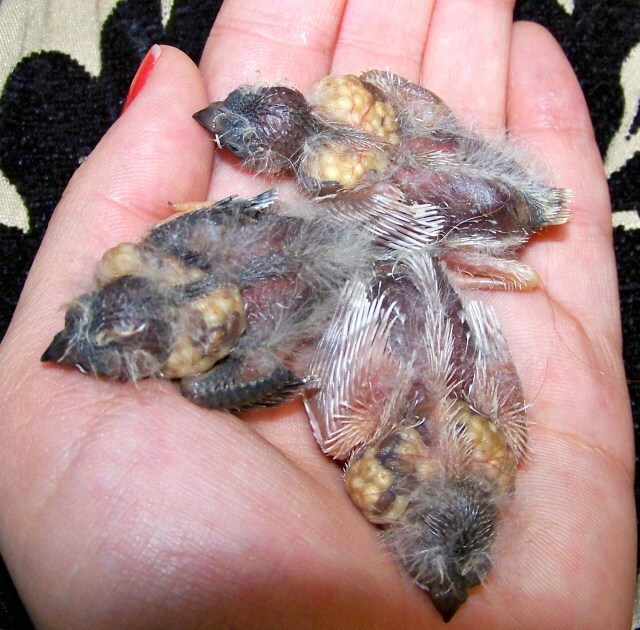 Weight: These finches are very light and weigh about 0.5 to 1 ounce (15 to 30 gm). Feather and Color: Males of the species are colorful. The chest feathers of the zebra finch are white, and so is the abdomen. The wings are grayish brown to pure gray in color just like its back. Underneath its wings, there are chestnut color feathers having small white spots on them. There is a black band often found around its neck. They have a black line running down each of the two eyes. Beak: The beaks of these birds form a perfectly sharp triangle, when closed. Their bills are bright orange in color. Head: The head of these birds is almost round and is mostly dusty gray in color. Tail: Their tail is black to brownish black with vertical white lines across. Foot: The zebra finch’s feet are bright orange in color, matching almost with its orange beaks. 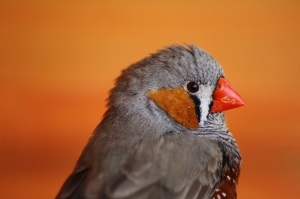 The male zebra finch has a distinct chestnut-colored patch on both its cheeks, which the female lacks. Also, the males are much bright in color and sings before breeding, unlike the female. 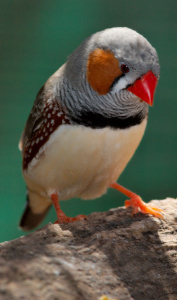 Common colors of the zebra finch include fawn, grey, and white. 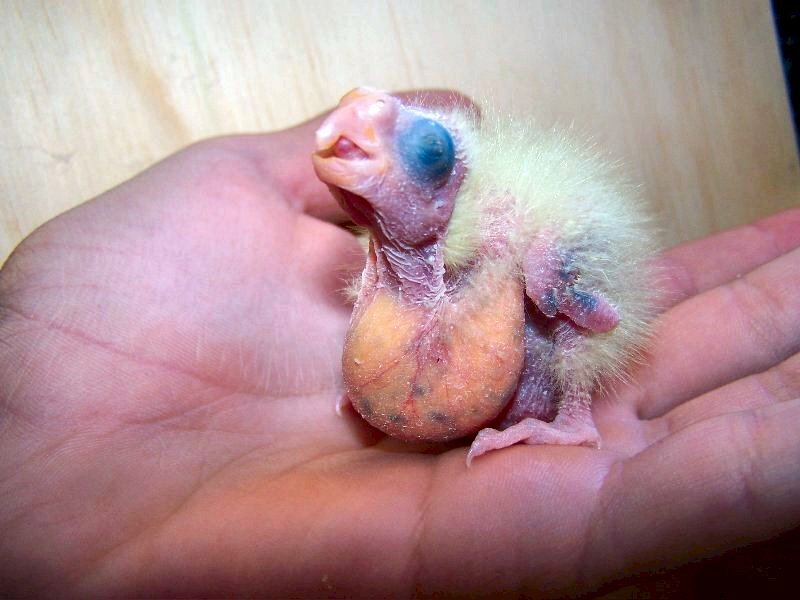 These naturally pied birds have been bred by breeders with numerous other colorations including pure white, tan etc. Such species are hard to be sexed, since both the genders look almost alike. Typical markings of these birds include yellow beak, penguin, crested and black breasted. 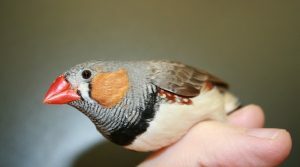 Black cheek zebra finch has also been popular among breeders. 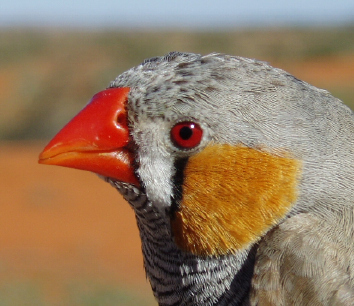 Zebra finches are native to Australia. They are spread across most parts of the continent, except the cold, moist areas of the south and some tropical areas of the north. It is also spread natively in some parts of Indonesia and East Timor, and has been introduced to the USA, Brazil, Portugal and Puerto Rico. Zebra finches love to dwell in grasslands and forests, open steppes with scattered trees and bushes, especially those that are close to water bodies. Taeniopygia guttata guttata, the Timor zebra finch, spreading across from Nusa Tenggara in Indonesia or Lombok in the Lesser Sunda Islands to Sermata, as also across the coastal areas around the Australian continent. Taeniopygia guttata castanotis is found over the wide range of continental Australia. It is the Australian race which is at times split as the chestnut-eared finch, the Taeniopygia castanotis. Zebra finches are diurnal animals and are sedentary by nature. Basically, these birds are very social living together in flocks of almost 100 individuals. During breeding however, these birds break their large flock into smaller ones, and each flock still keeps contact with the other flocks. The finches recognize the other members of the same flock by their sounds and songs, and allow the friendly members to come close to their nesting areas, driving away individuals from other groups. Their territories are small by size, and social dominance hierarchies often develop after female individuals are introduced in the flocks. They travel large distances together in search of food. Zebra finches are omnivorous birds, although, they primarily feed upon seeds. However, they also consume types of vegetables, fruits, nuts, leaves and insects. Insects are especially important for the mother finch during pregnancy to ensure healthy baby finches after they are hatched out of their eggs. Finches are garrulous birds. They have a high-pitched voice and can call loudly. They love to chirp, especially when with another individual or in groups. However, they won’t mimic humans. They emit loud meep, beep, a-ha! or, oi!. 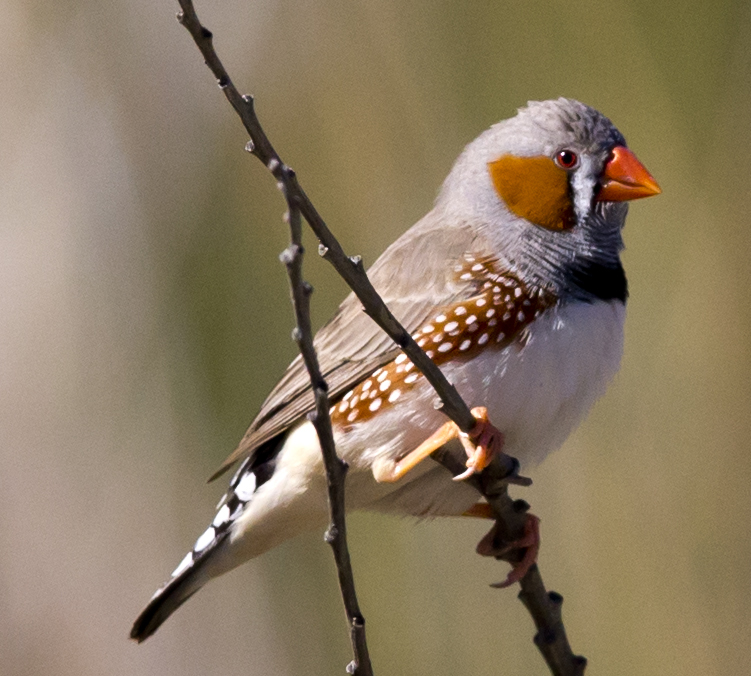 Male finches start singing during puberty, especially during mating. Pet finches often respond by chirping when their owners talk to them. Wild zebra finches have adapted themselves to human disturbances, nesting and dwelling in the urban areas inside manmade structures, water holes etc. The shape of the bill of these finches is such that, it is easier for them to husk seeds before eating. As an adaptation to the dry weather of their country of origin, Australia, these finch birds immediately start to pair off and breed during sudden rainfall and warmth. In the dry weather of Australia, they have also adapted themselves to be able to stay without water for a long time. 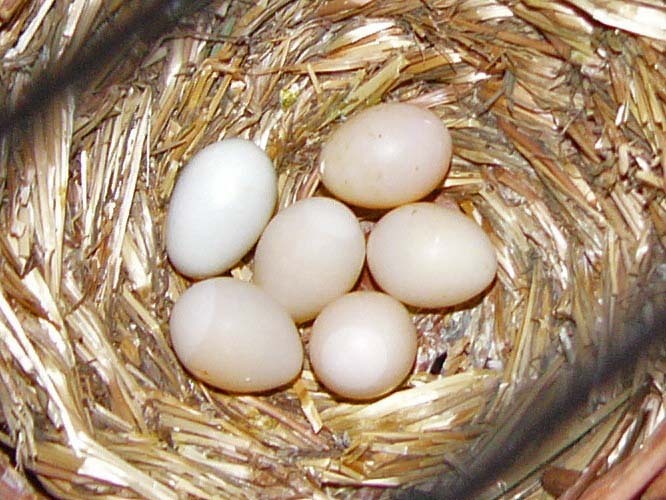 Many small mammals prey upon the eggs of the zebra finch. Also, other animals like the dasyuridae, different diurnal birds of prey like the falcon, snakes, mice prey upon the zebra finch. In the wild, the lifespan of the zebra finch is 2 to 3 years, whereas in captivity, they can live for up to 5 to 7 years of age. 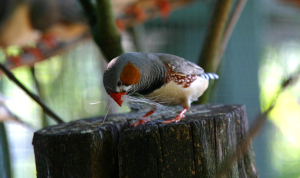 Zebra finches are ideal for beginners and easy to keep as pets. This songbird is friendly by nature and are adapted living close to the humans. After adoption, they can also be trained easily, if they get the perfect training from an experienced owner. Cage Setup: Large wired cages are apt for the zebra finch, inside the house or in open-air aviary, with the base of it covered by plastic. There has to be some horizontal bars at different heights, so that the finches can sit upon, hop and perch. Round cages for finches is unsuitable. However, the cage bars should not be more than 12 mm or else, the birds might escape. Cages should always be kept away from direct sunlight. Exercise: Allowing the birds to come out of their cage at least once a day is enough for them as their daily exercise. Although, this should be done only after the birds are used to the room, and only when all the doors and windows of the room are locked. Sleep: Covering the cage with cloth at night would encourage the finches to sleep at nighttime. 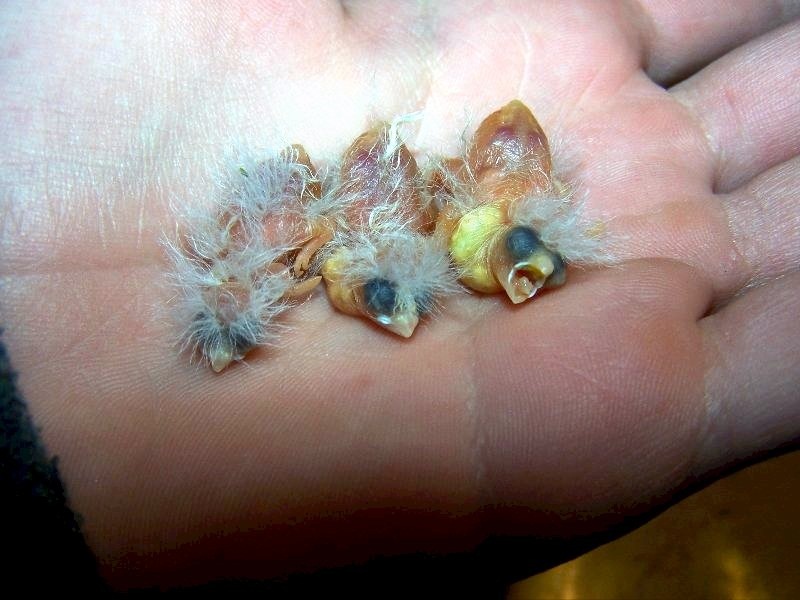 Food and Diet: Seeds, especially grass seeds, can be provided to the pet finches as the main food in their diet. Commercial finch mix is also available in the market to feed the finches. However, supplements can as well be given to them. Also, freshly chopped small pieces of vegetables and fruits can also be given at times. Giving them a treat of cuttlefish would provide them with enough calcium. There must also be a constant supply of fresh water. 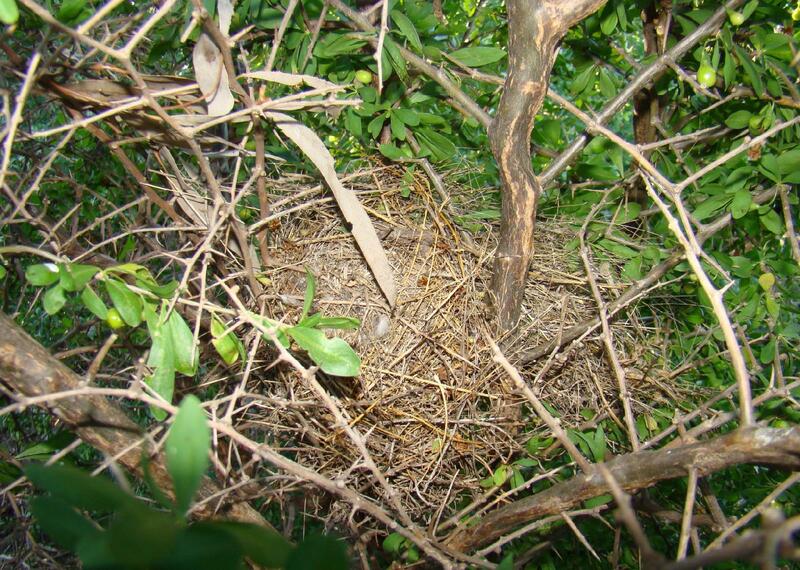 Nest: For nesting, a simple cardboard box with doors and windows and a base made of soft leaves or cottons can be ideal for them to feel safe about their eggs and babies, and they would start to mate and breed. Bathing: Finches love to take bath and clean themselves, if a flat container filled with water is placed inside the cage. Handling: The zebra finches don’t really enjoy being handled. They might as well give a bite if they feel uncomfortable or agitated. Being extremely delicate creatures, they should be handled very carefully, or else it might hurt the bird. Zebra finches are monogamous by nature and do not have any specific breeding season or interval. They generally breed after periods of heavy rainfall, at any time of the year. Before reproduction, mating call is common amongst male zebra finches to attract the females. Both the male and the female reach their age of sexual maturity by 2.5 to 3 months. 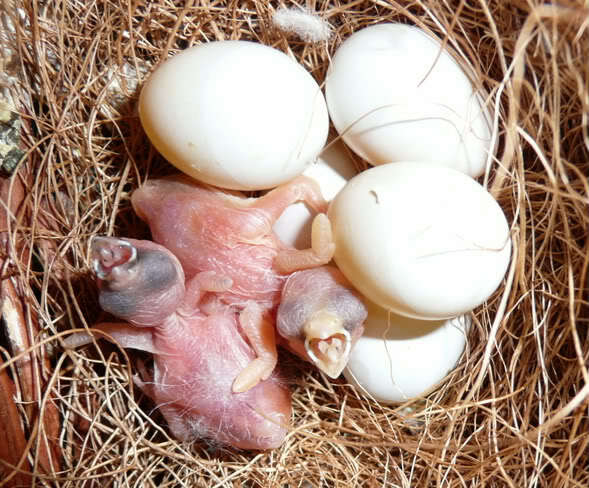 The finches can breed continuously as long as there are appropriate conditions. Each clutch takes around 2 months to rear. 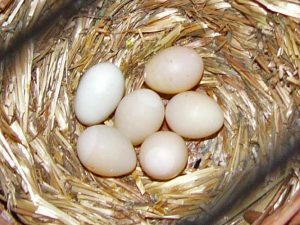 After the gestation period is over, they lay about 4 to 6 eggs (clutch size) at a time. The average time for the hatchlings to come out of their eggs is about 2 weeks, while the average fledging age is about 3 weeks. not being able to sit upright. 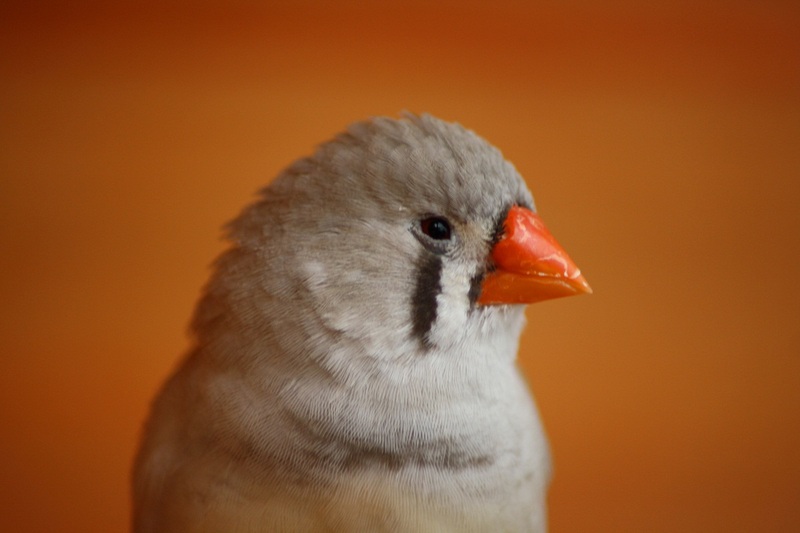 Treatment: As treatment for the zebra finches, individual medicines are easily available for each of the diseases in the pet store or vet care clinic. 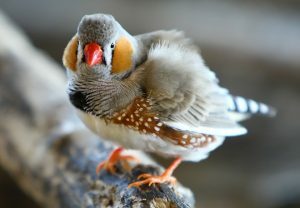 The zebra finch has been listed by the IUCN 3.1 as “Least Concern” due to its increasingly high population. Some types of foods can be harmful to the zebra finch, which include lettuce, avocado, lemon, potato, or any sweets or drinks designed for human consumption. The zebra finch first came to Europe from Australia centuries ago, but no knows exactly when, by whom they were brought there, or who bred them for the first time. It is a mystery. Pet zebra finches love plenty of toys inside their cages to play with. 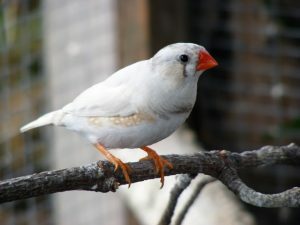 Among the birds which had their genome sequenced, zebra finches stand second in rank only after chicken. 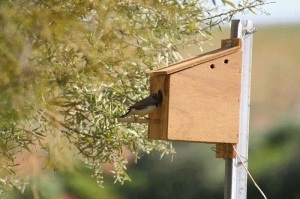 I have zebra finches that come to my feeders daily here in Southern California. They are absolutely my favorite visitors! They have been nosing around my patio and I was wondering if they were looking for a nesting spot. What can I do to encourage them? © 2019 (Animal Spot). All rights reserved. Reproduction in whole or in part without permission is prohibited.